A weak, fuzzy little dog was pulled from a storm drain in Vista. Photo Credit: OnSceneTV. 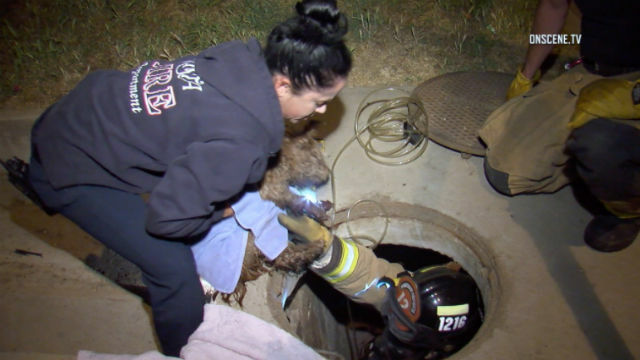 Crews had to rescue a dog trapped in a storm drain in Vista Saturday night, confirmed the Vista Fire Department. When firefighters arrived at the scene they heard a whimpering dog. Vista Fire Deputy Chief Ned Vander Pol said the trapped dog was located on the 700 block of East Indian Rock Road at the intersection by North Citrus Avenue in Vista at about 10:30 p.m.
Chief Vander Pol told the Times of San Diego that they tested the air down the storm drain with an atmosphere monitor device. Once they confirmed the air was not safe to breathe, a firefighter strapped an oxygen tank to his back. While wearing the breathing apparatus, the firefighter lowered himself into the storm drain and picked up the small and listless dog, said Chief Vander Pol. “One of our firefighters was able to give the dog some water and warm him up a little,” said Chief Vander Pol. Firefighters fed the dog a mixture of water and glucose and gave it some oxygen, said Vander Pol. Then fire crews gave the dog to San Diego Sheriff’s deputies. From there it was taken to the San Diego Humane Society, according to the Vista Fire Department. “Every indication was that the dog will be okay,” said Chief Vander Pol. The medical condition of the dog is currently being evaluated at the Oceanside campus, said Elizabeth Pecsi-Guerrero, a representative of San Diego Humane Society. Pecsi-Guerrero says the dog has a microchip and they will work for the next four days to try and locate the owner. If attempts to reach the owner are unsuccessful, the dog will likely be put up for adoption. It was not yet clear how the dog ended up down the storm drain. A medical evaluation had not been completed yet.